It's hard for me to believe a year has gone by since Gabriella was born. I remember it as if it were just seconds ago. It was a big day. I wasn't expecting her to come so early. I guess I should have since I had experienced preterm contractions a couple of times. My chemotherapy started some contractions at 30 weeks. I spent 5 days in the hospital. The contractions didn't cause any progression. They were just consistent. I had them every 2 to 3 minutes. I was so out of it on the magnesium drip I lost track of time. They Life Flighted me from one hospital to another. I was upset I was sharing a room with someone. She was complaining of feeling sick and here I was on chemo and pregnant. I thought it was risky for me to be around her. They never did get me the private room they said they would. It was a horrible long week. I was connected to a baby heart monitor the whole time and catheterized as well. I never got out of bed and my baby's heart beat was constant in my ears. It felt weird when I left, because I couldn't hear that heart beat anymore! At 32 weeks I had my last chemo. I had more contractions but we were ready this time. The hospital was able to stop them in one night. I had the steroids injected for her lungs the first time I went. I was very hopeful things would be OK.
Last night as I was getting ready for bed, I looked in the mirror. I saw my scars staring back at me. I used to have a fairly nice chest, I hear myself thinking. At the same time I only think this based on what I know others are thinking when they see my scars. Truly they are such a part of my body now that I rarely think twice. This occasion I was looking in the mirror and studying them. I realize they are my "war wounds" and I should be "proud". It's just a constant reminder of how hard it was. I look at that scar and see how it sinks into my chest where they had to actually shave bone. I didn't even know they were going to do that until it had healed a bit and I saw that the inner tip of the scar was sunken in. To top off that beauty I have a nice little radiation tattoo in the tip of it. My port scar is on the other side of my chest. It was not supposed to be a big scar, but for some reason that one did the keloid thing. It's gotten fat and red and puffy. I can't figure out why that one did and the biopsy scar did not. I think I am thankful though. If the biopsy scar which is much bigger and longer did the keloid thing it would be gigantic. The morphological characteristic of a hypertrophic scar is the excessive formation of the scar, due to an increased number of collagenous fibres. Bulgy, connective tissue raises above the surrounding skin level, however limited to the original wound area. Immature hypertrophic scars show a reddish colouring and tend to be itchy. Keloids often develop long after the wound healing has been concluded. Surplus production of connective tissue fibres is so excessive that it causes the scar to spread widely beyond the original wound area onto healthy skin. Keloids have a reddish colouring and they itch, burn, prickle and can often be painful. Treatment of keloids is rather difficult since surgical removal is often followed by relapse. The disposition towards scar keloids is often genetic and increasing numbers of young women are being affected. It's not so much that I am bothered by my scars appearance. I just get lost in thought when I see them. I realize I have this constant reminder. When I wear shirts that reveal them I see others staring wondering. I sometimes just want to say "I got in a knife fight." I'm a mere 5'2", 102 pound girl. So that saying is honestly even more hilarious in person. I guess I do dislike how the scars look. I can't even really remember what my chest used to look like. That's OK though. They are a part of me now and though I wouldn't choose to have them I think I can live with having them. Isn't that what they call it? A pet peeve....or something that annoys you. It really gets you upset. Well I have always considered myself to be very mild mannered with a very long fuse. There are few things that really get me mad. If they do get me mad it's a slow build up. I have a pretty long fuse. Eventually that fuse will burn down and then just watch out. I can't even promise to make sense at that point. Here is what bothers me. If I go to a fast food restaurant why is it so incredibly hard to get the order right? I know most of these places hire teens who perhaps aren't super concerned with getting some one's cheeseburger right. I get that. I am patient with it really. When I was young I worked at a fast food place. I know I got in pretty big trouble if the cash register was even a penny off. I knew how furious customers could get so I did my job with care. That was before I had any kids. It seems ages ago. It's not so much getting something wrong on a specific order. I ask for no tomatos for my hubby and it has tomatoes. That's irritating but not the end of the world. There is one specific place I have in mind. I won't disclose what restaurant because that's really not my style. It's a well known fast food chain. It gets my order wrong every single time I have ever been there. I order a chicken taco, I get a steak burrito. I ordered a chicken taco the other day and got some strange beef taco with some tortilla chips in it. I am usually in a rush so I'll start counting things in the bag, trying to see if it's right. One time I actually thought hey, they got it all. Then I realized that with a yummy side dish I had been craving and was ready to dig into came with no forks I was less than thrilled. I was a good 30 minutes from home. What's worse is when you get no straws and you live that far from home. It's pretty much ice water by the time you get home. I have considered contacting the restaurant owner/manager or something. It's so bad that it's now a running joke that the order will be wrong whenever we go there. I wouldn't go if there were another restaurant nearby of the same type...but there isn't so I am stuck hoping whenever I get a craving, that they'll get it right. I am so bad at it. I do procrastinate. What is odd is I procrastinate the things I want to do. I get the laundry done, cook supper, clean the house. Then I sit and relax. I am working on a drawing but haven't picked it up in probably 2 months. I had my last drawing sitting on a shelf for more than a year. Obviously I was sick for a year and that had much to do with it but still. I procrastinate. I am crocheting a baby blanket. I love doing it, yet it sits. Why do we do these things? I am not really sure. I think with the drawing anyway I have to really concentrate. I have to work hard, think hard and get into the whole mood. It's hard to have 5 seconds to really focus on anything without any outside distractions. Regardless, I am going to get that drawing out tomorrow. I'd like it to be a Christmas gift for a special friend. I am also being asked to do a drawing for someone else as a Christmas gift. This one I will be paid for. It's a commission so I can't exactly put that one off. I am glad though. I need a good kick in the pants on occasion. Here are a couple examples of my work. This was my first drawing after reading a book called How to Draw Like like Pictures from Photographs". I think that's the title. It's by Lee Hammond. If you have any basic drawing skills you can get better reading this book. You must work hard and really apply what you learn. I definitely had a bad year in 2007. I could say I felt sorry for myself and throw a pity party. There were several times throughout my illness I wanted to do just that. I was never in the right place to cry. I remember choking back the tears so many times. I want to let loose but there were several reason I didn't. 1. My kids. I didn't want them to think I was going to die. 2. My husband. He was being strong for me, but I also didn't want to scare him thinking I'd lost hope. He needed to know I was tough enough to beat it. 3. I was always in front of a doctor or around the family. So I never really just broke down. Oh I have cried. Just not ever like that. I didn't cry like I imagined I would. I get emotional during Kleenex commercials so honestly, you'd think I would have that moment. Then I come across a blog of a man who lost his wife to cancer, then his dad. Other terrible things happened to him as well. I also read another ladies blog who lost 5 people to cancer in a short time. I may have had a hard time, but you know there is always someone out there who had it harder. I am thankful for my happy ending. I am thankful I am here with my children and that I made it through something so difficult with a beauty baby too! Thanksgiving is upon us and boy do I have a lot to put on my list. While I was going through my illness and the few times I did allow myself a few tears it was when hearing a certain song. It wasn't sitting around feeling sorry for myself either...though I think still I'd have been perfectly justified in doing so. I never really thought there was anything wrong with it. It may have been good for me even. But with my children, I just didn't want them to see that. So I listened to this song, by Lindsey Haun. The song is to a great CMT movie, Broken Bridges with Toby Keith. The song however, I relate to something completely different. Listen to the words. This song strengthened me. The words encouraged me and helped me to see a stronger, brighter, better day. I wanted to share it because honestly this song applies to anyone going through a hard time. *video was slowing down my blog. So I removed it. Find "Broken" by Lindsey Haun on Youtube. It's a wonderful song. Yes. I just read it on MSNBC. Seriously. There was a traffic accident on the way to the cemetery and the coffin hit her in the back of the head. She was just 67. Her son was with her in the hearse. I read that the father was dancing the previous weekend and had a heart attack. Now his mother is gone too. I cannot imagine! How completely unexpected. I think the whole situation has got to be a first. Still, my heart goes out to the family. Not only did they have to deal with the loss of two loved ones, but in such a very creepy way. I think I had a whole lot of ideas in my mind about what radiation treatment would be and I think for the most part I was pretty far off. You can have all kinds of side effects. Some people have worse effects from that than the chemo. Luckily I was not one of those. I really don't remember feeling much if any side effects. I was already tired so I don't know if radiation made it worse. I didn't really get a sore throat like they completely expected me to. I didn't get a burn like a sunburn in the radiated area. So I think all in all I was pretty lucky as far as that goes. Radiation started December 3 2007 I believe. I had just delivered Gabriella on the 17th of November. My first appointment took the longest. I had to go in and get scans, measurements, adjustments. It's amazing how even a slight movement affects the radiation. They would quite literally poke me to the left or right with a finger so softly you wouldn't believe they'd moved you at all. I had to lie down on the table that you get your radiation on but I lied down on this crinkly white almost Floam type of material. Do you know what Floam is? Well it reminded me of that. Then I have no idea how but all the sudden this stuff started tightening around me. My arms, head, sides, etc. Pretty soon they had a hard solid mold of my body. 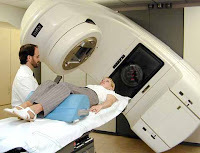 Each day when I got my radiation I would like down in this mold to make sure I was always in the same position. They'd still roll me this way and that way but I had to lie in that mold. The radiation machine was large. It was open. There was this huge arm that came out over my head. They inserted this huge heavy looking Plexiglas type of thing. It was big, square with random drilled holes. It looked like something a kid could do. They slid that thing into the machine and then would leave the room. The lights would go down, the machine made a very very faint buzzing noise. It would do this for a minute or 2, click a few times then buzz again. All in all maybe 5 minutes tops. That was it. I was done. It felt like nothing had even been done. I had to do that 17 times. Like I said, I had no side effects at all from it that I know of. Not everyone is guaranteed to be that way but this was just my own little personal experience. I don't state any of it in a professional medical point of view but just your average person point of view. I didn't mind it honestly. I got to know the people there and they seemed genuinely happy to see me when I came in. I made them all cookies for Christmas. At my last treatment we all said with a chuckle, that we hoped to never see each other again. Yes I got some blog awards this week. Thank you so much to Your Fun Family for these awards! I love being cancer free. I love tickling my girls. I love anything with sugar! This headache I've been nursing all day forgetting to take something for. When my kids get sick. When strangers touch all over Gabbi's face. This happens too often. Sleet. Yes. I hate it. I know we'll be seeing it a lot now that November is here. I also got another award from Juicy Alligator. The award comes from Maternal Spark. Oh I can move my feet. It's a matter of wanting to. 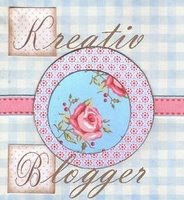 I got a few blog awards this week! I love getting them and I wanted to thank those who gave them. I also got tagged. I saved these in my e-mail and am going to post those up tonight. I get a little lazy sometimes but I do plan on getting those done. 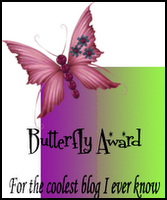 I feel it's an honor for anyone reading my blog to feel it's worthy of an award from them. I'm feeling just a tiny bit drained today because Gabbi did in fact catch my second cold. I had a bad sore throat for a few days only a few days after I recovered from the first cold. Well Gabbi got it and worse. She ran a slight fever last night and was coughing. She would occasionally whine in her sleep so of course, I wasn't getting any sleep. I brought her to my bed and cuddled her and today she seems to be feeling better. She's stuffed up, but better. I hate seeing a little one with a sore throat. I am guessing that's what was wrong. She can't tell me that. I know I whine and get upset when my throat hurts. I plan on doing a blog post tomorrow about chemotherapy during pregnancy. I want to get some good accurate information. I have a whole lot of things in my head but I don't want to just babble out what I already know. So look forward to that coming soon. Gabbi has taken a liking to suckers. We don't give them often, but this particular brand has no allergens in it. The package clearly stated no milk, nuts, eggs, etc in these so since she has a milk allergy I was pretty excited. I gave her a sucker and helped her with it. Other than sticking it in her eye and trying to touch her hair with it (ouch) she did pretty good! 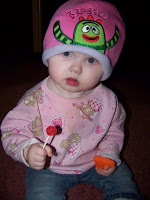 Oh and we bought her a Yo Gabba Gabba hat. That show is well...odd. But since her name is Gabriella sometimes we call her Gabbi Gabbers or Gabba Gabbers, etc. Well every time this show yells Yo Gabba Gabba I think she believes they are saying her name. haha It's cute. She likes it and it seems pretty harmless. So here she is modeling her hat and eating her sucker. She sure has grown a lot from that Christmas pic from last year in the previous post hasn't she? Wow. Oh and she was holding a tiny little plastic water gun. I didn't let her hold it long as it's not really age appropriate but she was really enjoying it for the short time I let her hold it.